At Personal Laser Clinic, we use the FDA-approved Lightsheer Diode Laser for hair reduction – the gold standard for laser hair removal. The laser emits a beam of light that targets melanin — the chemical that gives color to our hair and skin. The targeted melanin in the hair follicles is damaged which results in the disruption of hair growth and regeneration (see Lightsheer Diode Laser video below). Your specific hair and skin types make a difference in the effectiveness of laser hair removal. 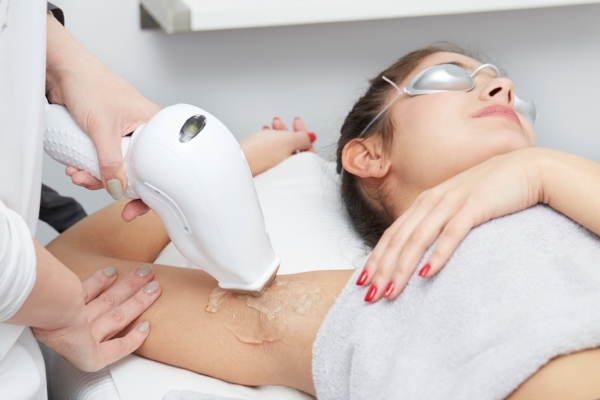 The ideal hair type for laser hair removal is dark and coarse. Light, fine hairs cannot be targeted by the lasers and therefore, cannot be removed with this method. Our upgraded FDA-approved equipment allows us to effectively treat patients with across the spectrum of light to dark skin tones. Laser hair reduction targets unwanted hair on the upper lip and chin, underarms, bikini, legs, and back, and anywhere else (except below the eyebrows). What about shaving rash or “beard bumps”? Laser treatment also provides a great benefit to those who get a rash or “beard bumps”, also called “folliculitis barbae”, from shaving. This procedure is also very helpful for patients bothered with ingrown hairs. Will there be any discomfort with this treatment? Most patients tolerate laser hair removal easily, but there may be mild discomfort during the treatments. If there is any concern that you will not be comfortable, we provide a topical numbing cream to reduce discomfort during your treatment. Are there age limits on the procedure? In general it takes from 4 to 6 treatments for a permanent, drastic reduction in hair. If someone requires more than 5 treatments, we usually provide up to 5 additional treatments of that area for just a fraction of the price. Dr. Sinsky meets with each patient for an initial consultation. Depending on the patient's need and preference, he may perform the first treatments. Patients may also have our licensed, specially-trained R.N. perform their treatments.